The Royal Sands Resort & SPA All Inclusive is a family-oriented resort that sits at the heart of Cancun’s breathtaking Caribbean shoreline with stunning views of white sand and turquoise waters and the best entertainment, shopping, bars and restaurants within walking distance. Unwind on the beach or by the pool. Work out at the fitness center and tennis courts or relax at the Spa. Whatever you decide to do, you’ll experience the gracious hospitality that is a Royal Resorts® hallmark. Resort amenities include pools, tennis courts, gym, beach massage service, a mini market, bicycles, sailboats, travel agency, car rental and an activities program for all ages. 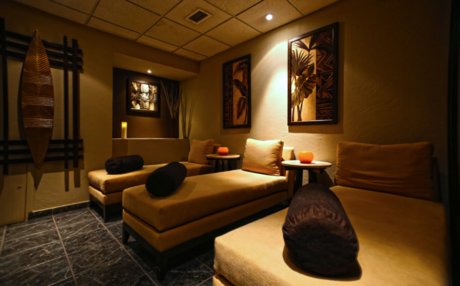 Pamper yourself at The Royal Sands Spa which offers a variety of luxury facials, body wraps and massages, a fitness center and beauty salon. 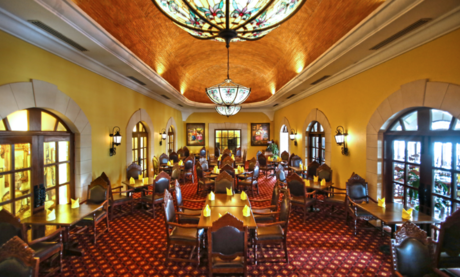 Dining options range from Hacienda Sisal, La Veranda, Char Hut Pool bar, Sands Express, Bartolo’s Pizza and Sidelines Sports Bar & Karaoke, so you never run out of options! Enjoy a worry-free vacation with all the indulgences of our All-Inclusive. Our package is unique because it gives you access to fine dining, activities & entertainment at sister resorts, The Royal Cancun, All-Inclusive, All Suites Resort in Cancun and The Royal Haciendas, All-Inclusive in Playa del Carmen, where more exceptional restaurants and amenities await you. Includes accommodation, food & beverages, Kids Club, gym, Wi-Fi & more! A complimentary guest shuttle also puts the activities and entertainment available at the other Cancun Royal Resorts within your grasp. Hacienda Sisal: Traditional Mexican cuisine, seafood, steaks and fajitas in a magnificent setting that evokes the estate houses of old Mexico. Mariachi music nightly and Mexican dinner shows during the week. La Veranda: A long-time favorite with guests for its International dishes, seafood and steaks. Open for breakfast, lunch and dinner. Theme buffets and poolside cookouts during the week. Char Hut: If you’re the kind of person who prefers a casual poolside lunch when you're on vacation, try the mouth watering hamburgers, delicious sandwiches and light wraps. Sands Express: If you prefer a casual meal at the comfort of your own villa, we have a practical food-to-go counter that offers salads, roast chicken, ribs, meatloaf and other main courses, bread and desserts. Bartolo’s Pizza: Pepperoni? Hawaiian? Vegetarian? Double cheese? Who doesn’t love pizza?! And it's perfect for both lunch and dinner! Make your order and have it conveniently delivered straight to your villa! Sidelines Sports Bar & Karaoke: Sports enthusiasts don't miss your favorite team playing or the tournament you never dare to miss! Come watch it at the Sports Bar! We have one 80” plasma TV and 2 60” plasma TVs for your enjoyment! Sushi Bar: Taste delicious and fresh sushi. Choose from the California Roll, Salmon Roll, Shrimp Roll, Tropical Roll, Sashimi and more, while enjoying a pleasant ambiance with your favorite cocktails. Indulge in a worry-free vacation with all the benefits of the All-Inclusive Package at The Royal Sands. The exclusive All-Inclusive package is one of a kind because it gives you access to delicious dining, activities and lots of entertainment at The Royal Sands and at sister resorts The Royal Cancun® in Cancun and The Royal Haciendas® in Playa del Carmen, where more outstanding restaurants and other all-inclusive amenities await! Your all-inclusive vacation at The Royal Sands Resort & SPA®, All Inclusive covers accommodation, dining, beverages, activities, entertainment, kid’s club (4-12 years), gym, Wi-Fi, access to the Fitness Center, taxes, tips and more. Keep in shape at the fitness centers with the latest cardiovascular equipment and weights. A trainer is on hand to help you at all times and to suggest workouts. Supervised kids club from 9am - 6pm for children between 4-12. Spend a morning at the Spa or playing golf, take them to the kids club where they will make friends as they enjoy games, crafts & sports! Please note that for guests’ stays crossing a Saturday night might need to change rooms. Should this be the case, The Royal Sands Resort & Spa will assist guests in order to make this an uneventful process. - Please note that a credit card or cash deposit will be requested upon check-in to cover any additional charges made during the stay. $300 USD per reservation. 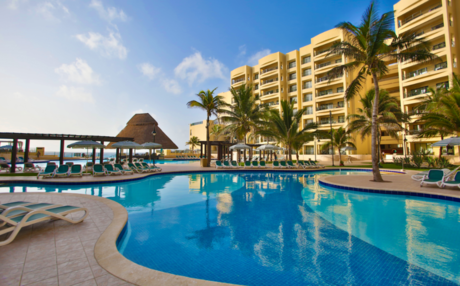 The Royal Sands Resort & Spa All Inclusive is the perfect Cancun lodging choice for your trip to Mexico. With numerous amenities for guests such as room service, car rental, children's play area, you will wake up at The Royal Sands Resort & Spa All Inclusive feeling ready to go every day for your time in Cancun. Don’t let this amazing reservation opportunity pass you by, book your stay at The Royal Sands Resort & Spa All Inclusive today to make the most of your time in Cancun, Mexico. 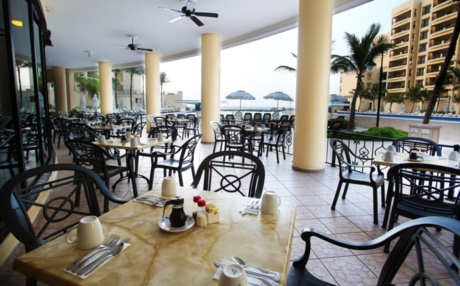 Beachfront hotel located in central Cancun.